Lately I’ve noticed that a lot of things get put off for “later” that really don’t need to be. It’s not just ordinary things like dishes and laundry, it’s stuff like framing & hanging pictures, buying things that you need but don’t want to spend the money on, and little things like cleaning out the crazy junk drawer. This week I accomplished four big things that I had been putting off. 2) We finally bought a kennel for our dog Penny. We managed to avoid this for a year and a half! It’s a good thing though because during the winter, we won’t have to worry about her peeing all over the carpet again. 3) I cleaned the downstairs couch (in the basement) that was covered in photos and photo boxes for MONTHS. We never go down there (except to do laundry) so for months I’ve put off cleaning off that couch. What an enormous relief it is to have it done! 4) I finally got caught up on my Photography homework!! I have been in this home study program for over a year and if I really sat down and did it on a regular basis, I would have finished it a year ago hah. Clean out the cupboard in the bathroom. It is a disaster. Complete first graded project for the Photography Diploma Program. Create a Recipe binder. I am up to my ears in new recipes to try but can never find the ones I wanted when the time comes… they are scattered all over and they must be put into one location. Write to Babicka (my great-grandmother). I always say I’m going to write and I never do. Write to our sponsor child, Fabiola. Figure out our Budget. Since Zoe has been born I have done a terrible job at keeping up with our budget. Get rid of all our junk. Find a plastic tub, label it “Stuff To Donate” and throw stuff in there. Tackle all of our 100,000 photos. Print, frame & put up photos, organize them, find proper storage (whether it be photo albums or a new hard drive for digital photos), and mail photos out to people who have asked. I plan to print out this list and post it on my fridge (something I look at every day). My goal is to have accomplished all of these things by November 18th. One month from today! For the past few years I have started my Christmas plans in October, start buying and packaging things in November, and then I try to leave the month of December for enjoying the season stress-free (at least that is the goal haha). In December I love to decorate the house, put up and decorate the tree, attend special church services and those adorable children’s Nativity plays (I very vividly remember being a sheep for two years and an angel for one year when I was a kid). I love to at least make an attempt to bake something, I love to watch Christmas movies, drink hot chocolate, spend quality time with family. Beginning my plans 3 months in advance has been a good system for me. However this year I came across a couple of websites that have got me super excited for the Christmas season! I think I just may begin my planning a little early this year, hehe. 1) Create a Budget and stick to it. Spend as little money as possible. 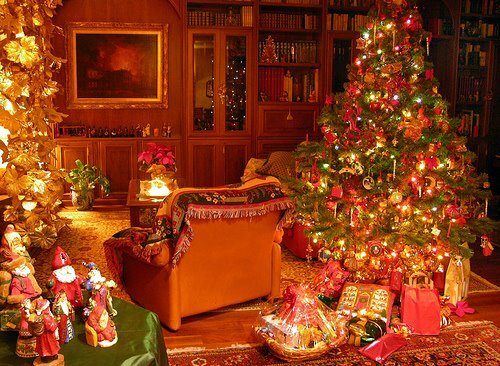 3) Have a Christmas Party, a small one with friends and family, in our home. 4) Find ways to keep the focus on the birth of Jesus rather than Santa Claus. 5) Create a “My First Christmas” ornament for Zoe with her hand print on it.